We launched our GIFTTT Guide this week! See our first five pics for the best holiday gifts that work with IFTTT. 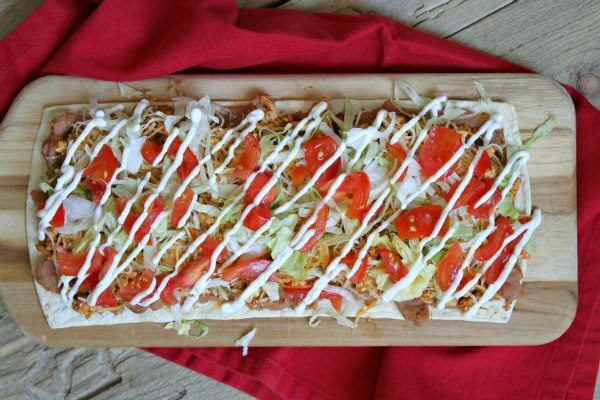 Here’s an easy recipe that will satisfy both your pizza and Mexican food cravings: Skinny Taco Pizza– and it’s Weight Watchers friendly! A short how-to video and the printable recipe are included at the end of this post. I’ve been hitting the gym and lightening up on my food intake for a couple of months now. With summer looming closely ahead, I’ve been focused on choosing products at the store that are helping me to limit my calories. Summer will be here in just a few days, so making more Weight Watchers- friendly recipes are going to help me feel more comfortable in a swimsuit! 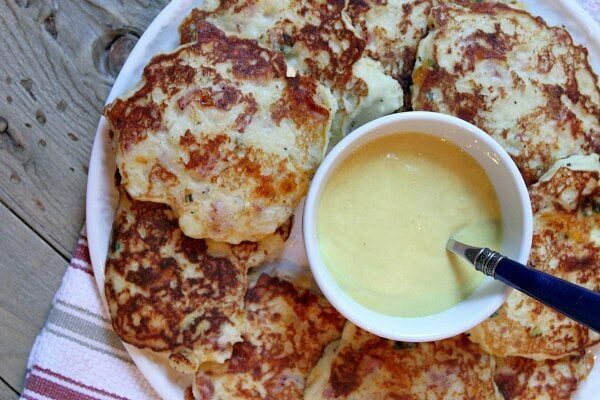 These potato pancakes are made from a base of already-prepared, creamy mashed potatoes. The mashed potatoes are combined with a few goodies to turn them into a batter that is perfect for turning them into pancakes. 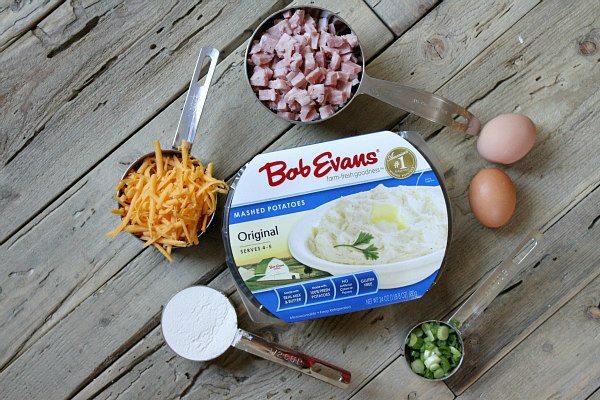 I’ve partnered with Bob Evans Foods to create a few recipes showing you what you can do with their line of refrigerated side dishes. Bob Evans’ sides are the #1 selling refrigerated side dish in the country. 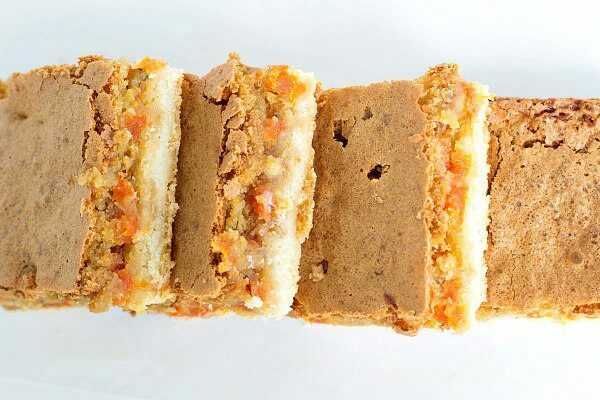 They’re great on their own or as the basis for quick, easy and delicious recipes. Bob Evans’ line of mashed potato refrigerated sides are what I’m focused on today. I used their Original Mashed Potatoes for this recipe. They’re made with real potatoes, real milk and real butter. My family LOVES THESE POTATOES. They are great for when you want to pick up a quick side to go with your main dish– so you don’t have to spend an hour peeling, boiling and mashing from scratch. These are a great, quick option to pick up from the store (think of those busy weeknights when you don’t have time to make everything homemade! ), and it’s a quality product that your whole family will enjoy. 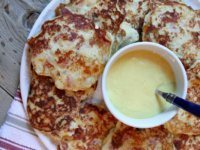 I do use the mashed potatoes on their own as a fabulous side dish, but today I’m showing you how to use them in a recipe to turn them into something else: Ham and Cheese Potato Pancakes! With just a few added ingredients, mashed potatoes can be turned into delicious little pancakes. 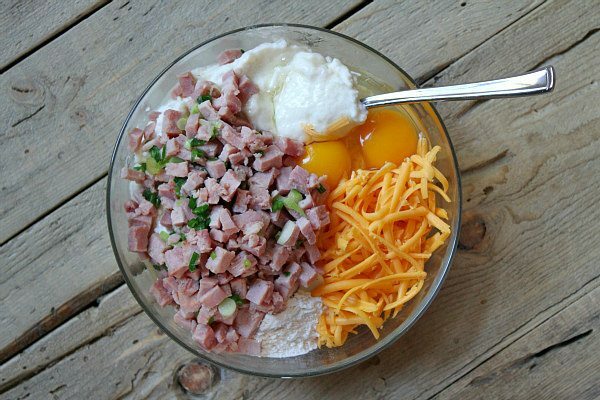 I’ve added flour, ham, cheese, green onions and eggs. Fry them up just like regular pancakes. They’ll get golden and crispy on the outside and stay tender on the inside. 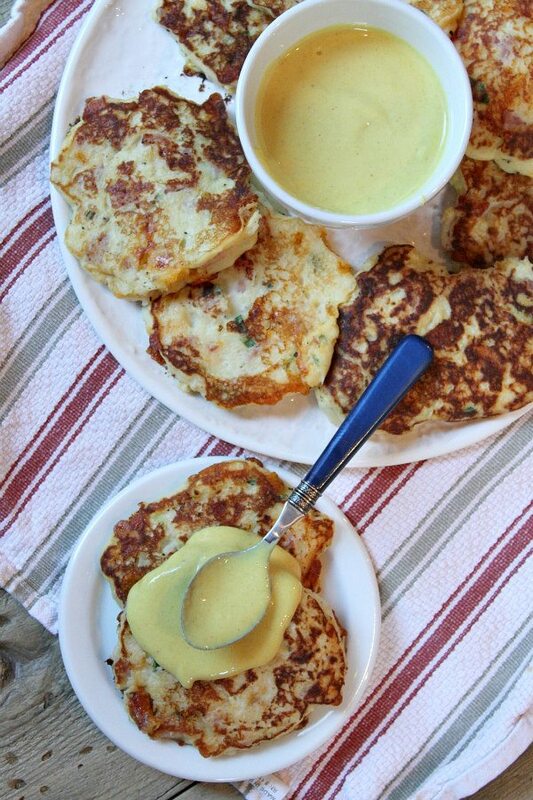 And they are served with a spoonful of creamy honey mustard sauce. 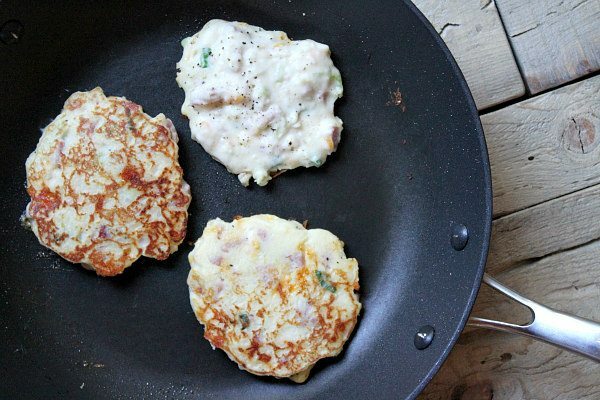 Since you’ve got ham and cheese packed into the pancakes, you can serve them as a main dish, as an appetizer, or as a side dish too. Isn’t it fun to see what you can do with mashed potatoes? For more recipes using Bob Evans’ products, visit https://www.bobevansgrocery.com/farm-fresh-ideas. Spray a large skillet with nonstick spray, and heat to medium. Sauté ham and onions until onions have softened and mixture is warm. In a large bowl, combine the cooked ham/onions with the potatoes, cheese, eggs and flour. Wipe out the skillet and spray again with nonstick spray. Spoon about 1/3 cup of batter onto the hot skillet (can do 3 to 4 at a time, depending on size of skillet). Spread into a 3-inch round, and sprinkle with salt and pepper. Cook 3 to 4 minutes on each side, until golden brown, slightly crispy on the exterior and warmed throughout. Serve with a drizzle of the honey mustard sauce. Disclosure: This recipe was made in partnership with Bob Evans Foods. This is a product that I know and use in my kitchen. All opinions shared are my own. 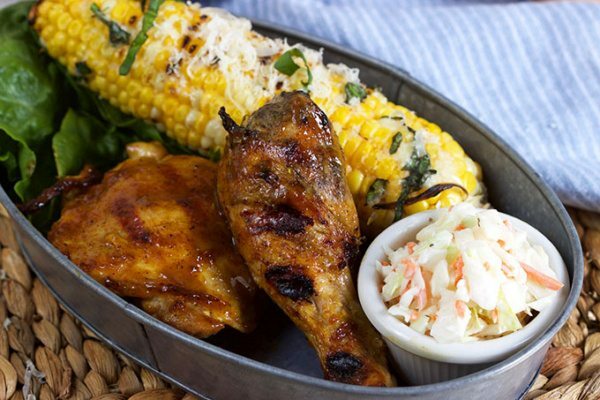 Light and tangy, Carolina Style Barbecue Chicken is the best way to mix things up at your next cookout. A mustard based sauce that’s a little sweet with a pleasant tartness is absolutely perfect for your grilled chicken. Ready in minutes! Hey y’all! I’m taking you back to the south again….I simply can’t help myself. I guess I’m just a southern gal at heart dreaming of long summer nights batting away the gigantic palmetto bugs and chasing down teeny lizards. I really do love it there, prehistoric bugs and all….nothing beats the leisurely southern pace and the food…..oh, the food. Hey, it’s my first grilling recipe of the season! And it was a big hit too! This is another recipe I’ve created using Smithfield’s line of already marinated pork. It’s so easy to work with their products because you get to work with pork that already has a base of great flavor because it’s pre-marinated. 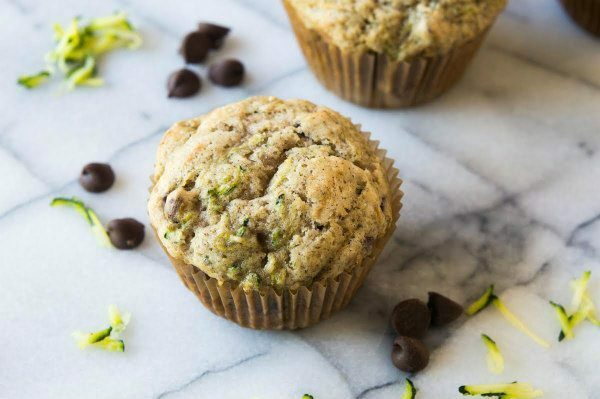 Try this muffin recipe to get a little green stuff into your children without their knowledge: Zucchini Chocolate Chip Muffins. As a kid, I hated zucchini bread. 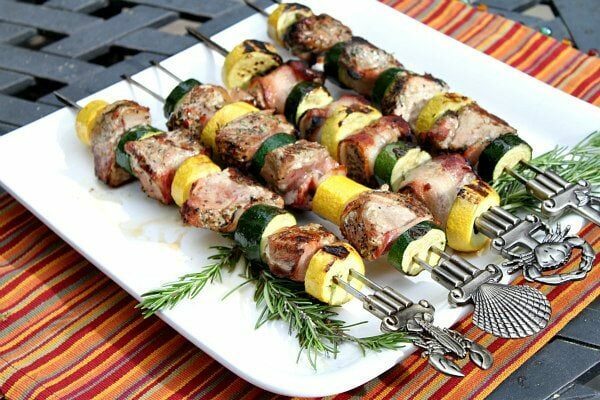 My mother used to make if often since our relatives used to dump loads of zucchini in our laps in the summertime. I just didn’t think it tasted good at all. So I’ve been reluctant to try zucchini bread recipes as an adult. This is an updated recipe from many years ago. The photographs I took for this recipe so many years ago were atrocious, so I chose to update it and share it again. 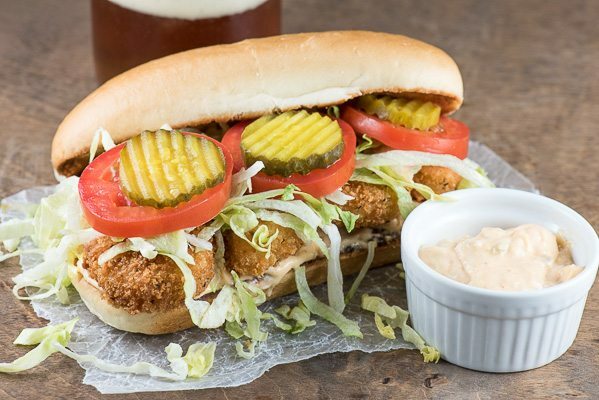 This Shrimp Po Boy is the perfect summer sandwich, with shrimp that has a light, crispy crunch and a pillow soft center, and packs big flavor when served with a spicy remoulade sauce. The days of summer have finally hit the Pacific Northwest, and at a balmy, beautiful and welcome 85 degrees, the biggest blessing is 0% chance of rain. I wasn’t sure that was even possible here!